Description: At the time this CRD series began (on LP! ), it was about the only glimpse collectors could get of Medtner's piano music in the stereo era. 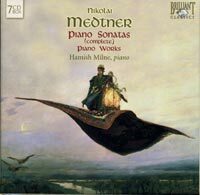 At budget-price, who can argue about its place in the Medtner discography, especially when its competitors are almost all still at full price? 7 CDs. Hamish Milne (piano). Original 1977-2000 CRD releases.